Just as I did with the main website, I rebuilt our brand’s voice on top of our new web style across every single page of this site. I wanted clear, friendly, and easy to scan content for our older members. Organization, consistency, and strong calls to action were also key to streamlining our content. Reinforcing our brand identity through a narrative was also an important part of reinventing this website. 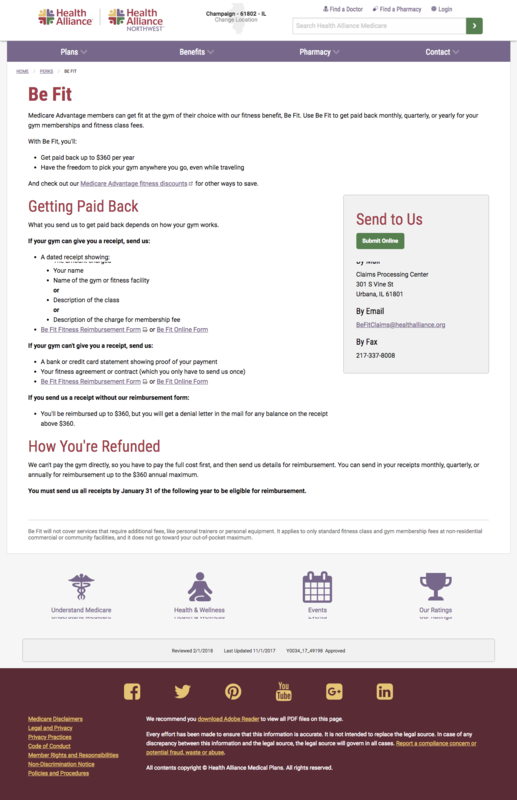 With searchable plan benefits pages, we were able to streamline sales funnel to help improve our user experience and the site’s experience and flow. Here too, I also focused on building out education that helped explain Medicare. 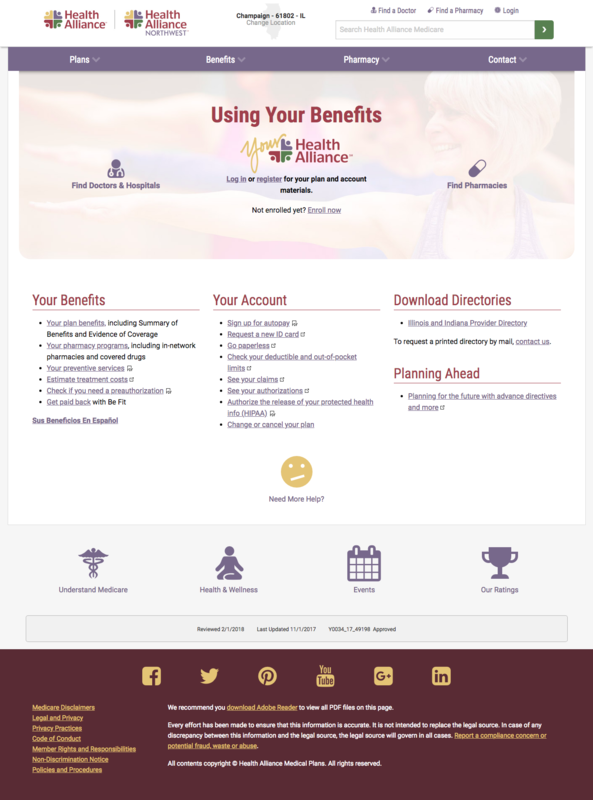 The Benefits page was redesigned to help customers quickly connect to the resources they need most. 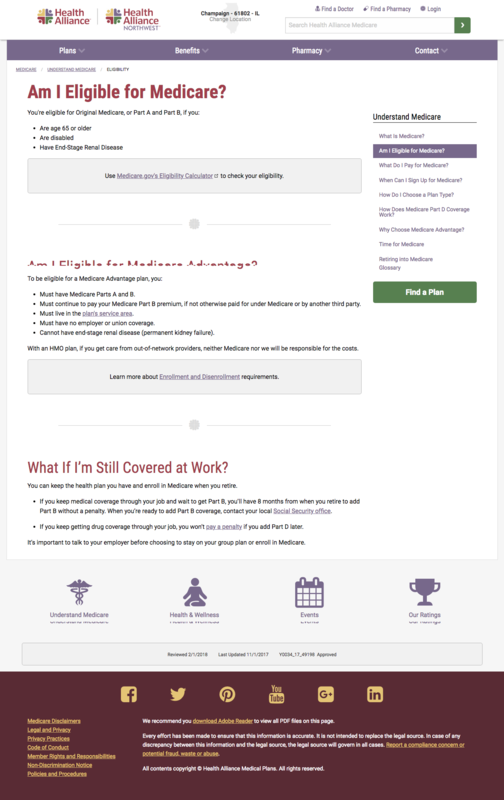 This is the Medicare brand narrative I wrote and helped design for our homepage to increase engagement. 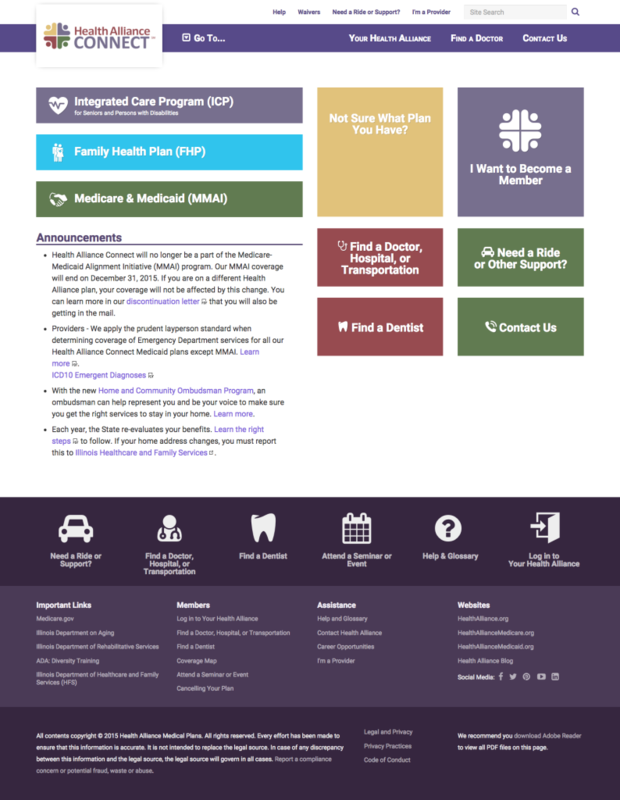 I wrote and helped design this CX-focused page as a landing page for Medicare members to connect to key parts of their coverage without logging in. This is an example of our location-based plans display, which led users into our sales funnel. I wrote and helped design this. 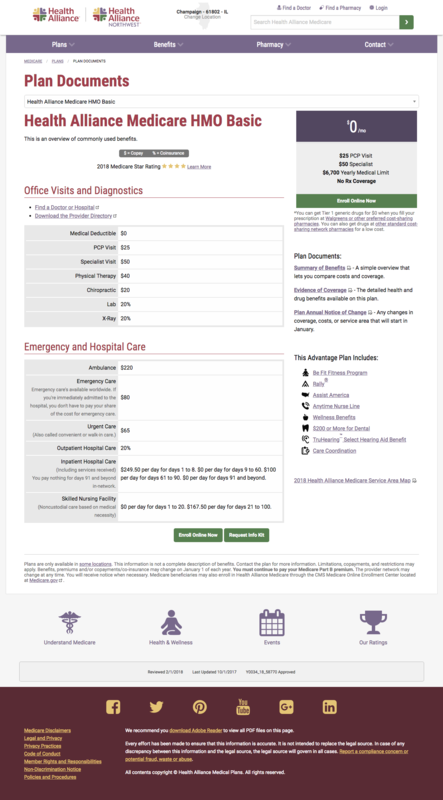 If you clicked on a plan on the previous page, you'd see this plan detail page. I wrote and helped design this. This page allowed you to compare key metrics of all the plans available in your area. I wrote and helped design this. 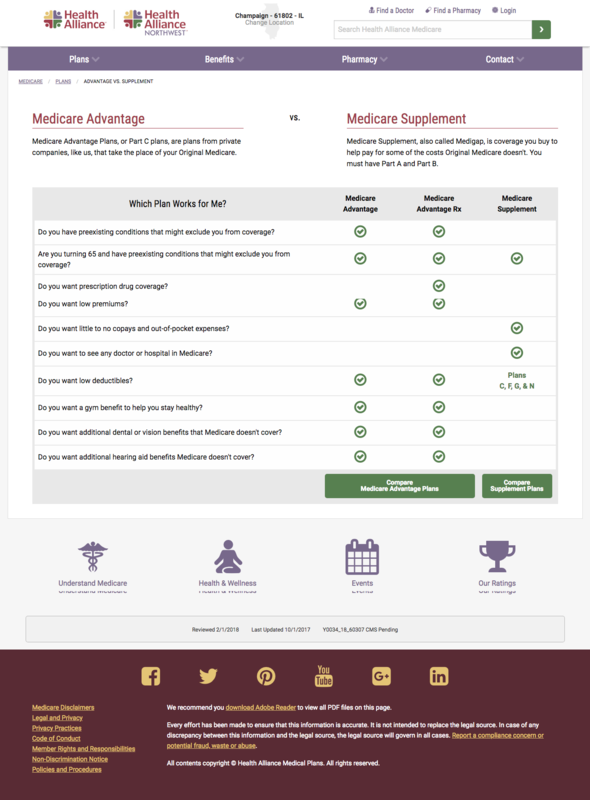 Understanding the difference between Medicare Advantage and Supplement plans was an area of confusion for members, so I wrote and helped design this page to visually represent that comparison. This was the plan page for our Medicare Supplement plans. 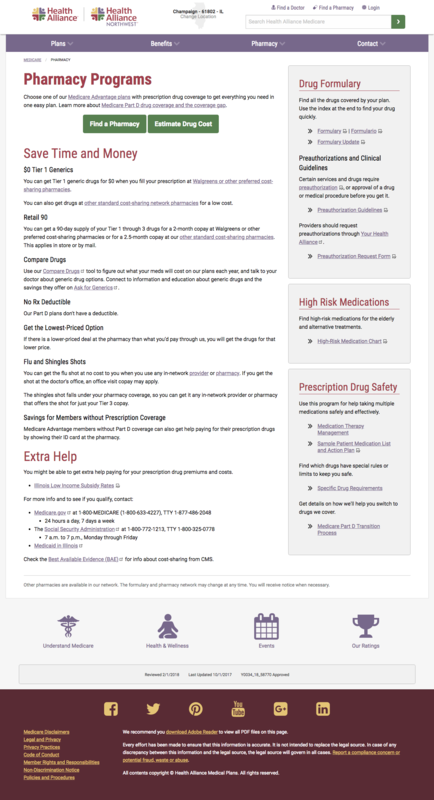 This landing page helps connect Medicare members to key pharmacy info and resources. I wrote, designed, coded, and maintained this visual representation of the perks that came with Medicare plans. This is a sub-page for a perk, Be Fit, that provides more details that I wrote, designed, and coded. 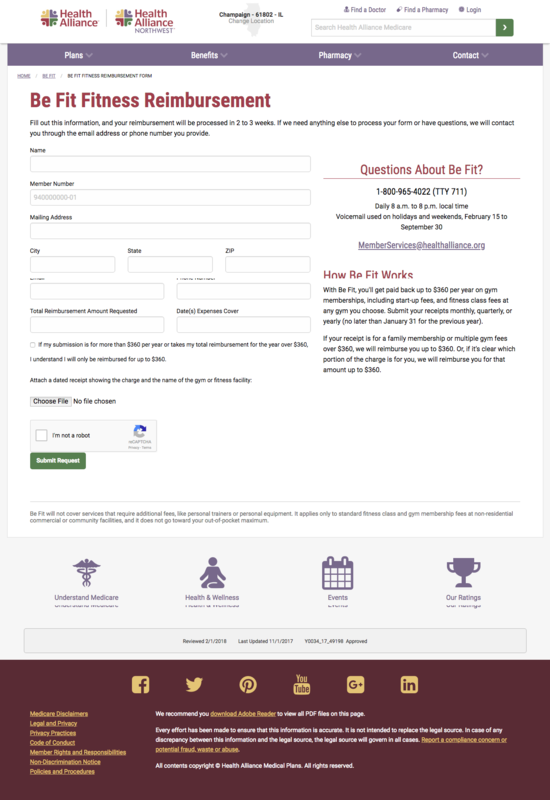 This form allowed people to submit receipts for reimbursement under the Be Fit program. 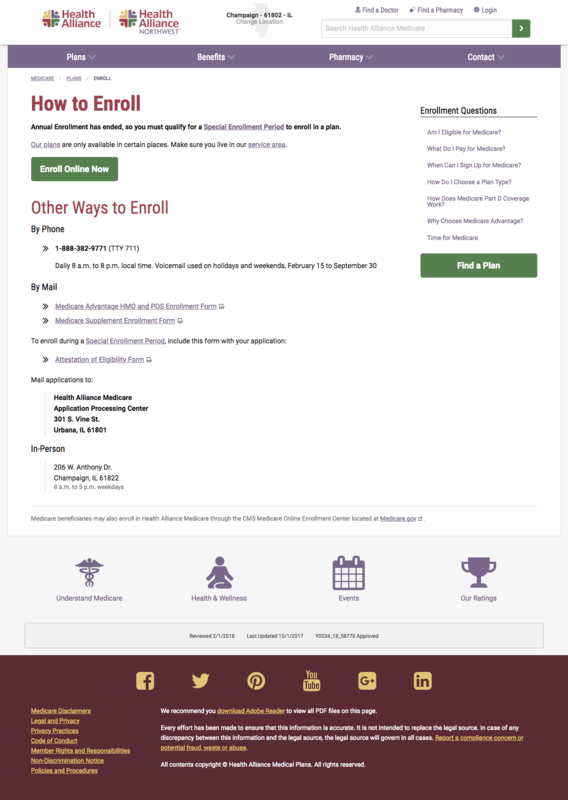 I spearheaded the effort to make an easy-to-use digital form for this purpose. 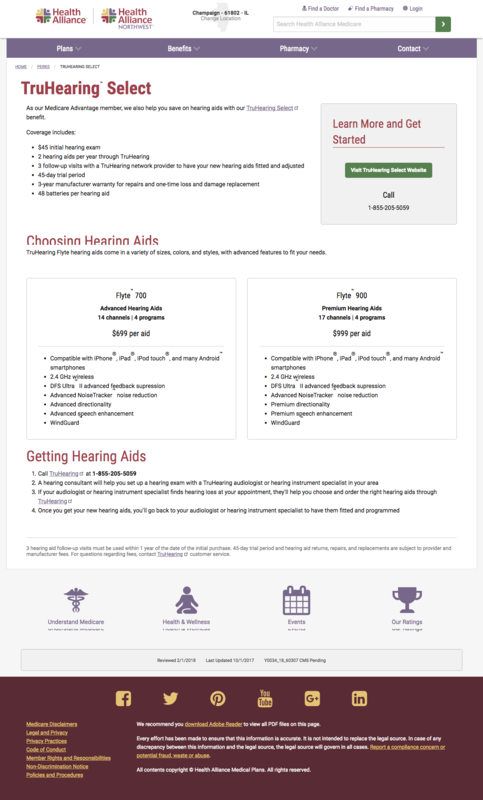 I wrote, designed, and coded this page for the TruHearing perk. I wrote, designed, coded, and maintained this educational section on Medicare as a pet project to help members better understand it. This project was also focused on boosting our SEO for Medicare. The following pages were part of that project. I also designed and updated the graphic on this page each year. This page is designed to be a printable checklist for people getting ready to turn 65 and switch to Medicare. This page is designed to be a printable checklist for people getting ready to retire and switch to Medicare. When I first arrived at Health Alliance in 2014, we also had a Medicaid product. We focused on making their website as easy as possible to use, with quick links to help them use their coverage easily.